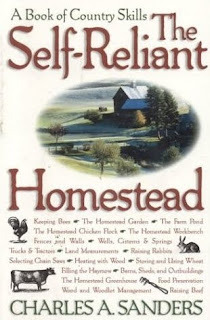 I adore reading books on homesteading. I always learn something. The thing about homesteading in north Idaho is it's not the same as homesteading in Indiana, or New Mexico, or Maine, or Louisiana. Every place is different and faces different climates, challenges, and requirements. 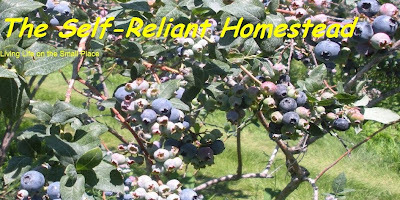 But a good homesteading book takes into account all these differences, and walks people through all the possibilities inherent with diverse locations and situations. I just got a copy of The Self-Reliant Homestead: A Book of Country Skills and I'm pleased to report it qualifies as a classically good homesteading book (high accolades!). It's particularly suitable for beginners since it covers moving to the country, equipment and tools, gardening, livestock, food preservation, wood heat and woodlot management, fences and walls, firearms, barns and outbuildings, ponds, wells and water, and other necessary considerations. This is an excellent resource and should be on every potential homesteader's library bookshelf. The author, Charles Sanders, also keeps a spiffy blog by the same title. If you're interested in homesteading but either haven't yet taken on the challenge, or are just embarking on your new adventure, I highly recommend this book! i ordered and recieved this book last week and it is indeed full of great information for homesteading...and his blog is really good too. i have found that it is not only interesting but very helpful to know what is going on with farming, homesteading, etc..in other states. sometimes, i can put tips and ideas to work for myself that i may never have even though of. Perhaps this book can help answer a huge issue.